Why do dogs have puppies, cats have kittens, and we have children with similar characteristics to ourselves? Because information is passed down through the genes, a library of instruction manuals on how to build all living things. Genes are made of the famous double-helical DNA molecule, that encodes information (the instructions) in its structure, in the order of the pieces (the "bases", of which there are four types) that make it up. RNA is similar, yet more dynamic, a worker rather than just a library. This is the basis of the science of genetics. The genetic information in these molecules can be tweaked by small changes (termed chemical modifications) that occur in cells. This action is called epigenetics, that potentially allows the environment to change our genetics to a small degree. For example, in RNA the most common epigenetic modification is the addition of a single carbon atom (a "methyl" group) to one of the four bases. So how does this work? Professor David Lilley and Dr Lin Huang have shown one way, published in EMBO reports today, that leads to regulation of the assembly of a large RNA-protein machine in the cell. First, they used structural biology (specifically X-ray crystallography) to study the effect of the modification on RNA structure, finding one particular kind of situation that was especially susceptible to structural distortion by addition of the methyl group. This particular structure is found in key RNA assemblies called snoRNPs in the cell that direct the modification of other RNA species. 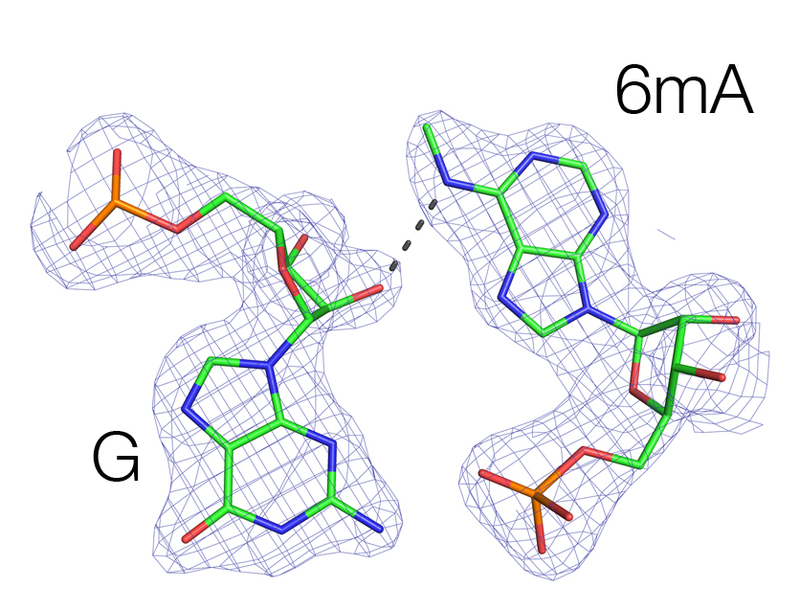 Huang and Lilley showed that in human cells, these structures have exactly the kind of methyl group addition that would prevent their assembly and function. Understanding this modification which is also found in mRNA and is proposed to have roles in RNA stability, translation efficiency and in gene regulation could provide vital insights into these processes and how this action might be exploited in human disease. ‘Control of box C/D snoRNP assembly by N6-methylation of adenine’ is published today in EMBO reports. Image: G•A base pair that is disrupted by the presence of the extra methyl group (on N6 of A). This is a crystal structure where the mesh depicts the electron density, which is what we determine from X-ray diffraction.